I'm joining up again with Nan from Mom's The Word for Making Your Home Sing Monday! You really should stop by her blog to read some great posts and to see what other people are doing to make their home sing! Last week I said I wanted to make my home sing by taking on the making of homemade yogurt. Well, I did it! It didn't quite turn out according to plan, but we ate it all and I'll be making it again this week. My friend (Thanks Katie!) 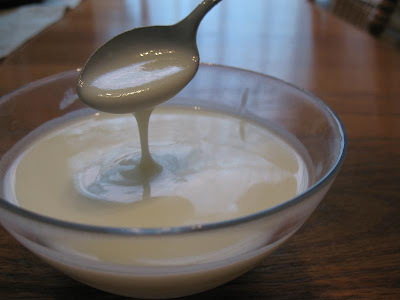 had made this yogurt recipe recently and was successful. It's a crockpot yogurt recipe from the blog A Year of Slow Cooking (if you're looking for slow cooker recipes, it's the place to go!). If you look up the recipe, you'll also want to read the suggestions and ideas in the comments. My friend added unflavored gelatin to hers before it sat for 8 hours and it turned out thick and creamy. I decided to be rebellious (there's that streak again) and make it just the way it stated on the blog. 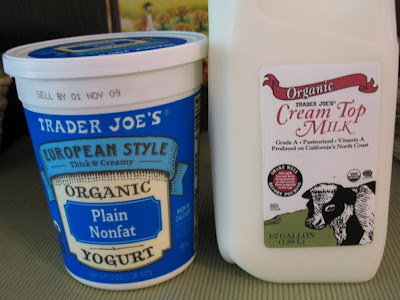 Here's the milk and yogurt (as a starter) that I used. I didn't mean to get nonfat yogurt - oh well. I made the yogurt so that it sat overnight in the slow cooker with a towel wrapped around it. And in the morning? It smelled like yogurt and there were some parts that had solidified a bit. I probably shouldn't have stirred it all up at that point, but I did. That's when I realized that I had some sort of yogurt "soup." Here's the yogurt after being chilled and ever so slightly thickened! I was told that I should try straining overnight through cheesecloth, but my hubs said not to bother. He was enjoying putting it in a glass, stirring in some jam, and drinking it. I put mine in a bowl with some agave sweetener, a splash of Trader Joe's vanilla, and ate it like a cold yogurt soup! It was yummy! And we finished off the last of it blended up with fresh peaches and raw sugar - mmmm. I'm going to make it again this week. I will still be rebellious and not add anything to thicken as I want to see if I can improve it first. I believe that my slow cooker did not stay warm enough, so I will heat a bit longer, store it in an insulated bag and towels overnight, and let it sit a little longer. It can't get any thinner - LOL! To continue improving my homemaking skills to make my home sing some more, I'll take on another project this week. I want to make a master grocery store list. I would like something that lets me circle the items I need and have it in the order I shop at Winco. I'll let you know what happens! 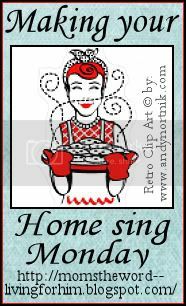 Are you trying anything new to make your home sing this week? Any yogurt improvement suggestions? I'm also linking this up to Your Life, Your Blog at Real Life! Head over to read what others are up to and link up your own post from the previous week! Yummo. Love homemade yogurt. Try it with a full fat starter and add some extra powdered milk if you want it thicker. I bought an inexpensive yogurt maker that basically keeps it at the right temperature and my yogurt has always come out perfect! You may look into that if you are going to continue to make it. Big runny but taste good size hugs to you! Good for you on trying out this new recipe! I make it all the time using full-fat plain yogurt. We love it at our house. Hmmm... this sounds like an interesting project. How many points does the yogurt end up being? Ahhh, memories! When the girls were little, I made my own yogurt all the time. I had a little yogurt maker and would buy packets of culture from the supermarket. I think I made my home sing yesterday when I baked chocolate chip cookies and made chicken in hot pepper jelly, brown rice and fresh green beans. Yummy! Great idea! And I am loving that slow cooker link you provided. Thanks, Lisa! I keep wanting to make this, but I'm worried it will make to much and then go to waste, as I'm the only one that eats it the most. How much does it make? My boys do like yogurt but it's not like they eat it everyday. My hubby won't eat it at all. If it doesn't make to much than I might be able to do it. I love all your homemaking projects. I really just need to dig in and do the few that I want to do (like making yogurt and making laundry soap). Thank you for joining in today! How neat! I may give this a try as I'm attempting to make more items from scratch in order to avoid processed foods. I did make homemade chocolate pudding for the first time this week to satisfy my daughter's craving - but that's not quite the difficulty level of yogurt!! My grocery list is in the order of the store (s) that I shop. It makes it so much easier!! I'd love to know how the next batch goes. I saw Martha Stewart make this some time ago. It looked like a "good thing"-ha! Oh, my gosh! I should start calling you "Martha!" I can't even imagine making my own yogurt, but I have made butter and it is amazing! Maybe I would actually like it if I made it homemade?